Vegas Implosions is an intensely-woven mapping of a post-modern landscape, written by a disgruntled slayer-becoming in the shadows. Chris D’Errico, clearly a wonderful rhizomatic love-child of Franz Kafka, Hunter S. Thompson, Jack Kerouac and Allen Ginsberg, begins a journey with grounded, loquacious, intricate observations and raw, reactionary prose-style poetry. D’Errico’s quest-driven compilation commences within a colourful, carnivalesque landscape; that which we know and love as – Las Vegas. D’Errico’s narrator, like a multi-headed phoenix, rises from his constructed disillusioned, desert dreamscape, seditious and sore. He partitions his book by turning the poetry autobiographical, in the first-person perspective. This section is titled, ‘Exterminator Chronicles.’ D’Errico journeys from the physical landscape, to the personal landscape and finally concludes with his ideal of fantasy-scape, which sees his narrator holidaying in Hawaii, where, contrastingly, the vermin and insects he exterminates daily now live in serene unison with him. Anything but obsequious (! ), D’Errico’s work reflects an ambiguous and torn position in his world. The subversive poem, ‘Black Flag’ sees the narrator tired of his love-less, soulless existence and he imagines a new plateau where he ‘switches sides.’ Rather than ‘bringing home the bacon,’ as he claims, he entertains the idea of a different warfare. This may be read as a new Travis Bickle waiting in the surreal throes or he could be advocating a pro-environmental message too. Thus, the diversity of meaning in D’Errico’s pieces allows the reader to indulge in a rollercoaster journey of entertainment, apprehension and uncertainty. D’Errico’s piece, ‘Exterminator takes a vacation’ offers audiences glimmers of hope. From the depths of self-annihilation, accusatory and destructive paradigms does he escape (for the moment) the cycle of reality’s tedium. The ‘voice’ in this piece transforms, like Kafka’s insect revelation; instead of death, rebirth is shown through use of language that transforms into the beautifully aesthetic and – spiritual. The South-Pacific trade winds have doused away the narrow mindedness and degradation that he perceived his home to be constructed of. His ‘take-home message,’ it seems, is that we are empowered to change and create the environments we desire to inhabit – and even if it is only via the vehicle of fantasy. Nonetheless, the psyche is able to be distracted, somewhat. Vegas Implosions is a subversive, manic conversation – emblematic of humanity’s continual, incessant, driving drudgery that plagues the modern world. It is sweat and loathing, desire and despising. Vegas Implosions is the every-day-man’s inner monologues screaming silently in queues and homes, everywhere. D’Errico is a talented poet with a sharp, sardonic, journalist’s eye of his pocket of the world. He exhibits a mindfulness and awareness that understands part of the human condition which is duende-driven and prone to fatal implosion at any given time of day. 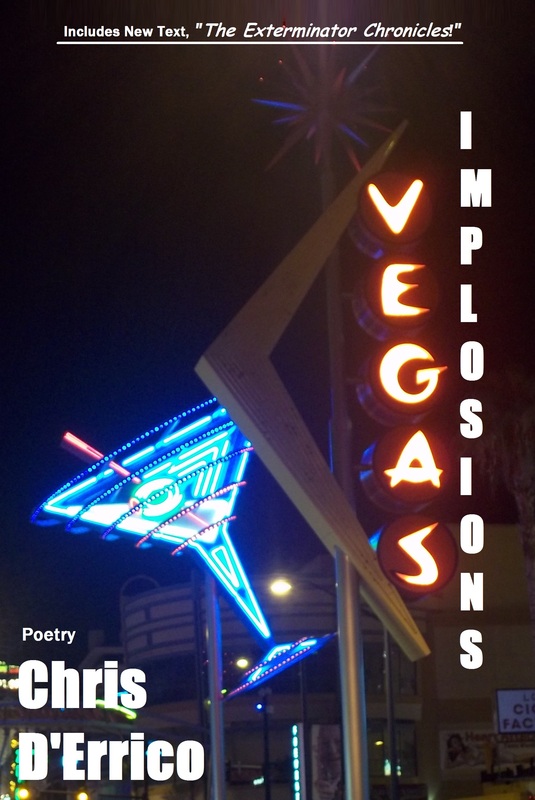 Vegas Implosions is not just free verse, it is cheap-as-casino-chips verse and yes I would purchase this book if I was browsing in my lunch-hour for entertaining gratification. It may be read randomly or cover-to-cover. Here D’Errico offers diversity and autonomy for his readers to be the navigators of text. While, perhaps not every reader’s ideal book of poetry, Vegas Implosions offers a ripped, psychedelic sketch of a landscape which has to be seen to be comprehended. Even then, one has to pinch themselves to know they are alive. However, D’Errico asks all the probing questions; indeed ‘why are all these people dying in bad shoes?’ When in fact we know the answer, as does D’Errico, all we need to do is kick them off! And then the world will show its passing, cold shoulder once more, but shoeless, we will be free. Michelle Gaddes is a writer from southern NSW, Australia. Her poetry compilation, Pariah is available from Ginninderra Press, Port Adelaide, Australia, and her forth coming, Aurora Borealis, from the same publisher. Michelle is currently editing her third manuscript and she teaches Regional & Environmental histories at the University of Wollongong, NSW. Michelle completed her M.A in 2011 with Deakin University (Writing & Literatures), Victoria, and her research interests are broad. She is interested in the contemporary representation of landscapes together with rhizomatic theories and post-colonial texts. Michelle has been published in the UK, Australia and North America via various print and electronic media; Danse Macabre, Gloom Cupboard, Carcinogenic Poetry, The Canberra Times, The Bemboka Times, Forward Poetry, Zygote in my Coffee, Scorpion Poetry, Rufous Salon etc.